Our decals are peel and stick. ALL items on this listing are printed on a coated, durable fabric material that is repositionable. Coated fabric looks similar to vinyl ... it is not soft and fuzzy like felt. The difference between fabric and vinyl is that fabric will not stretch and is difficult to tear; whereas, vinyl will stretch and tear easily making it non-repositionable. You can see a video on "Fabric vs. Vinyl Decals" on YouTube if you search for that term. There are no authorized resellers of our decals. If the shipper is anyone other than Nursery Decals and More, Inc., then the decal is not made by us and is likely a poor quality knockoff. All items are a FABRIC repositionable/reusable decal material that is easily removed without damaging walls. Decal Includes: 3 Balloons ranging in size from approx. (4.9"h x 4"w) to (4.7"h x 3.8"w), 3 elephants (approx. 15.5"w x 10"h; approx. 10.8"w x 7"h; approx. 14"w x 9"h), 1 Owl, 2 Bird, Butterflies, Grass, flowers with stems, plus 3 extra flowers to use with girl elephants. Manufacturer: Nursery Decals and More, Inc. Publisher: Nursery Decals and More, Inc. 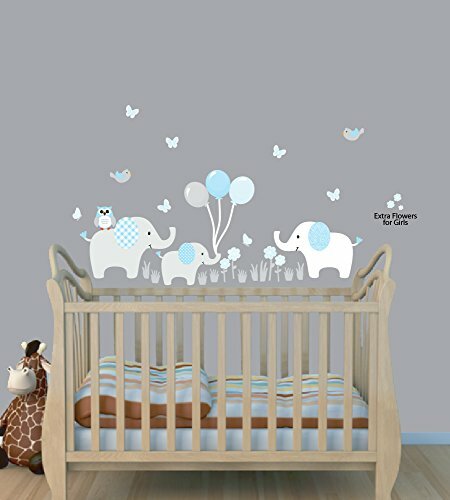 Studio: Nursery Decals and More, Inc. If you have any questions about this product by Nursery Decals and More, contact us by completing and submitting the form below. If you are looking for a specif part number, please include it with your message.